Hydraulic drive Aussie fast fill Poly pumps are real “cost cutters” for farmers handling aggressive liquid fertilizers and ag chemicals. A range of 2” and 3” fast fill liquid fertilizer pumps with hydraulic drive have been released by Australian Pump industries . Part of the Aussie Poly pump range, the hydraulic versions offer big self propelled sprayer operators the ability to carry a tank filling pump onboard the sprayer. This facility minimises refilling time and eliminates the need for separate engine drive chemical pumps. The Aussie Poly pumps offer farmers real efficiencies with the ability to pump liquids at up to 1,100 litres per minute. That means reloading times can be cut to a minimum, improving efficiency and allowing contractors to complete cycles faster and at reduced costs. Both 2” and 3” configurations of the pump offer a choice of either high flow or high pressure impeller. The high pressure version allows heads of up to 35 metres, that’s 50 psi, whilst the high flow 2” unit offers up to 700 litres per minute flow. Spray operators wanting to refill in the absolute minimum time like the 3” version because of its huge 1,100 lpm flow rate. The pumps are manufactured from 30% glass filled polyester, a material that is both strong, light and compatible with most agricultural chemicals. Polypropylene internal parts are also available. A range of elastomers including Viton and EPDM allow compatibility with virtually all agricultural chemicals. Optional Buna N seals and check valves enable these versatile pumps to handle both salt water and oil based products including diesel fuel. 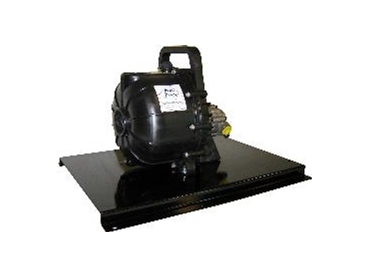 The hydraulic drive is provided by a compact motor close coupled through a purpose designed pedestal arrangement with direct drive to the pump’s impeller. The design is simple, efficient and trouble free. Aussie Poly pumps are widely used by the military, in aquaculture and for decanting chemicals used in both the manufacturing industry and agriculture. “Because these pumps are made from injection moulded glass filled polyester, there is no machining required and performance is perfect first time, every time” said Aussie Pumps Product Manager, John Whiteley. Incorporating the hydraulic motor in the circuit of a self propelled or even towed style spray rig is easy and can be carried out by any experienced hydraulics fitter.